Zha Shibiao, also known as Meihe or Erzhan, was from Xin’an in Anhui province. He is regarded as one of the four masters of the Xin’an School, and is renowned for his dry brushwork and sparse composition. 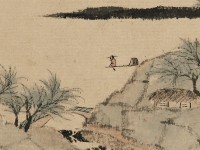 The artist studied for the civil service examinations before the fall of the Ming dynasty, and it has been suggested that his subsequent departure from official life in favour of painting may have been prompted by lack of sympathy for the new rule. From the 1670s onwards Zha Shibiao lived in Yangzhou. His family owned collections of paintings and bronzes, and he himself was a connoisseur. In painting he followed his contemporary Hong Ren (1610-1664) and master from the Yuan dynasty, Ni Zan (1301-1374). Purchased with the assistance of the MLA/V&A Purchase Grant Fund, theArt Fund, and Friends of the Ashmolean Museum, 1980. Zha Shibiao was from Haiyang near Xiuying in Anhui province and is associated with the Anhui School, renowned for dry brushwork and sparse composition. 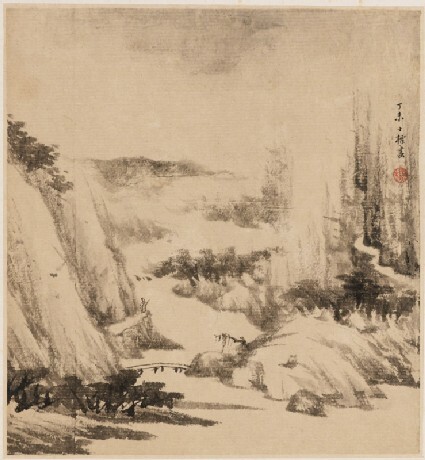 Zha Shibiao studied for the civil service examinations before the fall of the Ming dynasty, and it has been suggested that his subsequent departure from official life in favour of painting may have been prompted by lack of sympathy for the new rule. His family owned collections of paintings and bronzes and he himself was a connoisseur. In painting he followed his near contemporary Hong Ren and the Yuan master Ni Zan. From the 1670s onwards he lived in Yangzhou.